We carry the entire line of Graham Gouache in the 15 ml tubes. If we are out of stock of a particular color we can order it for you. There are 3 colors that come in 60 ml tubes that we can order for you. We receive Graham paints about every 3 weeks, more frequently if it's back to school time. I* Traditionally considered permanent, actual lightfastness is dependent on a wide variety of factors. Gouache colors are designed to be applied opaquely, however the nature of each pigment will create variations of opacity. 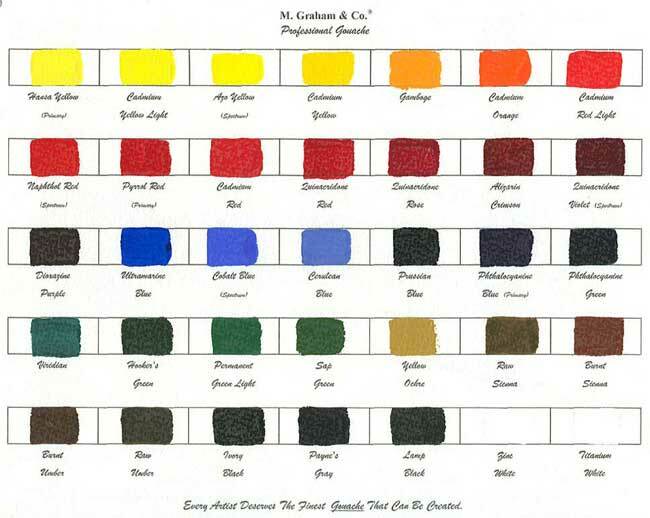 Colors like Alizarin Crimson will retain their transparency unless mixed with white. M. Graham Gouache is pure color. It does not contain chalk or adulterants to alter the nature of the color. It is left to the artist to alter opacity with the addition of white for specific techniques. Each color has been formulated for layered application regardless of opacity. 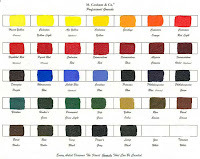 Click on colorchart to enlarge.